Algeria to hold July 4 presidential election after mass protests - SABC News - Breaking news, special reports, world, business, sport coverage of all South African current events. Africa's news leader. 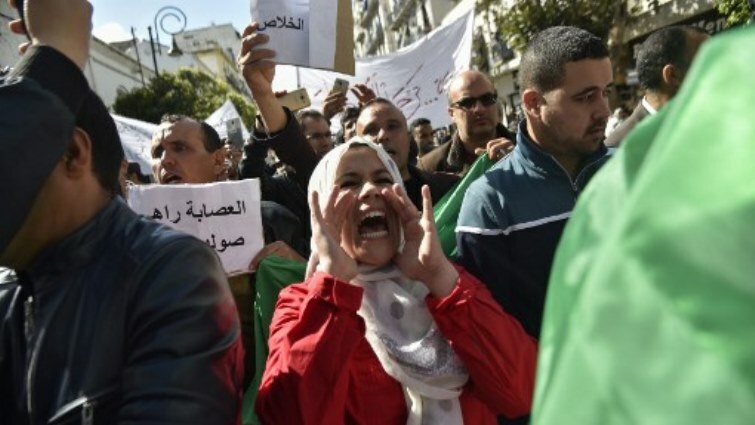 An Algerian protester shouts slogans during an anti-system demonstration in the capital Algiers. No further details were immediately given. On Tuesday,interim president Abdelkader Bensalah had said he would organise free elections within 90 days. Lieutenant General Gaid Salah’s comments were the strongest hint yet that the military would play its traditional role asking maker after the ailing 82-year-old Bouteflika bowed to popular pressure and quit on April 2 after 20 years in power. If Bouteflika had seen through his original plan to run fora fifth term despite growing grassroots opposition, that would have put the military under pressure to restore order, instead of focusing on swaying politics from the shadows. The military has faced little resistance from protesters;rather, their fury has been directed at what is popularly described as the fortress – an FLN-associated old guard that has been entrenched for decades. This entry was posted on 10 Apr 2019,08:42PM at 8:42 PM and is filed under mobile-leadstory, Africa, News, Homepage Latest Stories Slider. You can follow any responses to this entry through the RSS 2.0 feed. Both comments and pings are currently closed.